I can’t remember where we picked up this one, but I do remember enjoying it the first time I read it. But reading it again recently wasn’t as fun as I remembered it being. 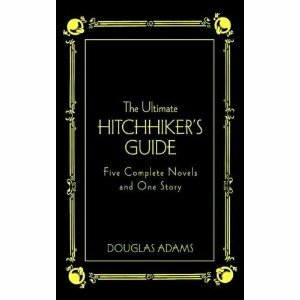 The Ultimate Hitchhiker’s Guide to the Galaxy contains 6 stories by Douglas Adams (The Hitchhiker’s Guide to the Galaxy; The Restaurant at the End of the Universe; Life, the Universe and Everything; So Long, and Thanks for All the Fish; Young Zaphod; and Mostly Harmless). I still really enjoy the first one…his humor and way of looking at things is a lot of fun. But I quickly lost interest with each successive story…particularly with the humor and language digging deeper and deeper into the gutter. I didn’t even finish reading the last two this time around…and unfortunately this book will not be going back on the shelf.